Russia’s Investigative Committee brings final charges against opposition leader Alexei Navalny that can have him jailed for ten years. In a statement Friday, Russia’s Investigative Committee charged that opposition leader Alexei Navalny was behind the embezzlement of 10,000 cubic meters of timber at the KirovLes state-run timber producer, which allegedly took place between May and September 2009. During that time Navalny was an adviser to Kirov Governor Nikita Belykh, a former leader of the Union of Right Forces liberal party. The damage done to the Kirov Region’s budget is estimated at 16 million rubles ($530,000). Under the charges brought Friday, Navalny, a prominent anti-corruption blogger and member of the opposition Coordination Council who launched the RosPil project to publicly monitor state procurement orders posted online, is facing up to 10 years in prison and a fine of up to 1 million rubles ($33,000). According to the Investigative Committee statement, Navalny colluded with KirovLes director Pyotr Ofitserov and the director of Vyatskaya Lesnaya Kompaniya timber reseller, Vyacheslav Opalyov, to misappropriate the assets belonging to KirovLes. Vyacheslav Opalyov was found guilty by a court in December of abuse of power and given a suspended sentence of four years. 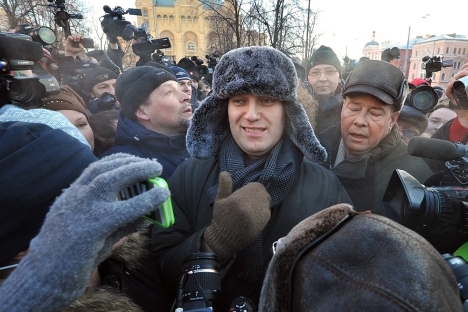 Navalny has rejected the charges, and denied any wrongdoing. The investigation is currently in its final stages, the Investigative Committee stated, adding that Navalny had refused to testify. In December the Investigative Committee launched a probe into another case, involving Alexei Navalny and his brother, Oleg, a manager at Russian Post. The Navalny brothers are suspected of fraud and money laundering. According to the Investigative Committee, they misappropriated 55 million rubles ($182,000) through a cargo shipment contract. In a third investigation, Alexei Navalny is being accused of embezzling funds from the Union of Right Forces, which transferred 100 million rubles ($3.3 million) to the account of Navalny’s Allekt ad company in 2007. In December, the former leader of the Union of Right Forces, Leonid Gozman, was cited by RIA Novosti news agency as saying that he was unaware that any funds had been misappropriated. In these two fraud cases, Navalny has also denied the accusations.